While Las Vegas is often referred to as “Sin City” an equally accurate moniker would be “City of Hotels”, or better yet, “City of Monster-sized Hotels”. A whopping thirteen of the twenty largest hotels in the world are located in Las Vegas. So, given all these big choices, how do you choose the hotel that’s best for you? How Luxurious a room do I need, and more importantly, how much can I afford to spend ? Will I be using the Pool? What shows, restaurants, and shopping will I do. How much gambling will I do. In general rooms are a tremendous bargain in Las Vegas, as the gambling (gaming is the preferred term in Las Vegas) revenue still subsidizes the room rates. Just look at some of the links at the end of this post, $149 for a room at Palazzo or Venetian with $100 resorts credits. In any other city in America these rooms would cost many times that amount. These are some of the nicest hotel rooms available anywhere. If you are looking for a budget room, the Tropicana has recently undergone a major $180 million renovation, and is offering rooms for $59 a night (see below). In Las Vegas even the moderate level hotels have fairly luxurious accommodations. However, if only the best will do, the most luxurious hotel rooms can be found at Wynn/Encore; Venetian/Palazzo; Bellagio and Aria. Initially Bellagio set the standard for what a top-level Vegas hotel should be, eschewing the glitz that dominated Vegas hotels in the 70′s and 80′s. Bellagio has an understated elegance that is the opposite of the longstanding norm of Vegas Luxury Hotels. Steve Wynn is the impresario behind Bellagio, hence it should be no surprise when he divested ownership of Bellagio and built the eponymous Wynn Hotel, in many ways he took the look and feel of Bellagio with him. Wynn also took many of the best people in Vegas with him, from cocktail servers to executives. Wynn/ Encore has the reputation of having the best customer service of any of the big hotel/casinos in Las Vegas. Probably the biggest potential drawback for Wynn/Encore is its location at the very North end of the civilized Strip. It’s a bit of a schlepp to get to the heart of the Strip, which is informally defined as the land occupied by Bellagio. City Center is the new “Latest and Greatest” on the Strip. City Center, as the name suggests is not a single building but a series of Hotels Condominiums and of course, a large casino. Aria is the large hotel which contains the casino. If you could imagine a bit of electronic gadgetry that could exist in a hotel room, you can be sure your room at Aria will have it. City Center also has a hotels sans casino: Vdara; Mandarin Oriental and Harmon(closed and already scheduled for demolition in 2012). The Veer towers, which slant towards each other at a 4.6 degree angle are condominium only. The big draw at City Center is lots of art work scattered throughout the vast property plus art galleries, including glass artist Dale Chihuly, the artist that designed the glass sculpture that hangs in the Bellagio Lobby. Venetian/Palazzo another high-end dual casino/hotel is located just south of Wynn/Encore across Spring Mountain Road, a pedestrian bridge allows for easy access between the two properties. The owner of Venetian/Palazzo had his roots in the convention business, and thus his properties are particularly Business Friendly. Of all the high-end properties in Las Vegas, the Venetian is the most highly themed, complete with a canal on which you can take a ride on a real gondola. The rooms are large, roughly 700 square feet, with the rooms in Palazzo being newer and slightly more luxurious. After the top tier of luxury hotels in Las Vegas, there is a broad middle range of contenders. Some of the properties like Mandalay Bay are just below the top tier, some might argue the new tower at Manadalay bay, THE Hotel, belongs in the top tier. Caesars Palace and MGM Grand have a large range of room quality, the newer towers at Caesars Palace are designed to compete against the top tier. The budget hotels include mostly the older properties, such as Riviera, Harrahs, and Flamingo. Even these older properties are constantly being upgraded, and should not be overlooked. The Flamingo has add a bunch of GO rooms which are trendily designed and filled with new electronics. The Tropicana has recently finished a major $180 million refurbishment including renovated rooms featuring 42-inch plasma television sets, iPod docks and updated décor, and hence should be on every budget minded visitors list. Will I be using the Pool in Vegas? The tropical and kiddie pools tend to garner the most attention. The Mirage set the standard for tropical pool areas, until Mandalay Bay built their elaborate tropical pool area, and added a sand beach complete with a mechanical wave pool. The hard Rock also built a tropical pool area, that is targeted for the kiddies. If you want a tropical pool but are on a budget, then the Flamingo is the place for you. The Flamingo also adds an adjacent Wildlife area, complete with flamingos. The most notorious kiddie pool is the one at The Hard Hack which is known for their Sunday “Rehab” pool party. Others have joined the fray, including Wet Republic Ultra Pool at MGM Grand and Palms “Ditch Fridays” The atmosphere is similar to a nightclub with swimsuit attire. What is San Simeon-esque? The following picture is from the pool at Hearst Castle at San Simeon, does that remind you of any of the pools in Las Vegas. Caesars Palace is clearly the most San Sinmeon-esque pool in Las Vegas. Bellagio and Venetian are also strong contenders for the title. 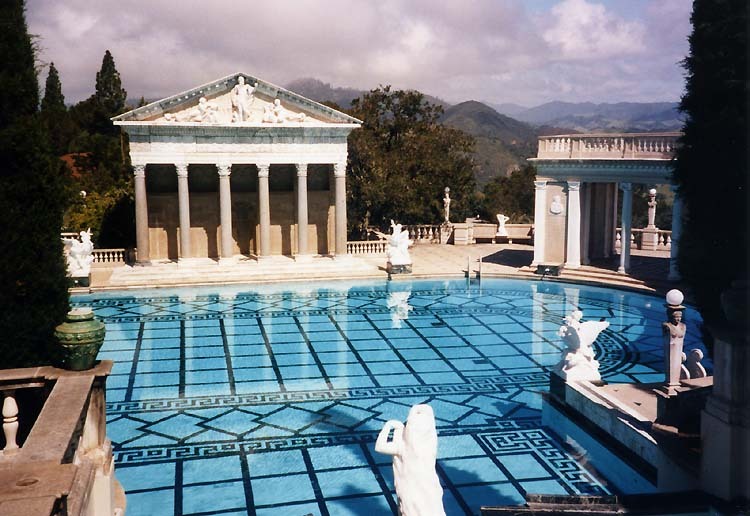 If kiddie pools are loud and rockus, San Simeon-esque pools are more sedate and stately. You could actually have a conversation without yelling at your consort, or perhaps read a book, yes that has been known to occur in Vegas. Some hotel pools are nothing special by Vegas standards, but are still nice, like Ballys, except for the long walk through the mall, and Paris. Harrahs is one of the least desirable pools in that it is both small and mostly shaded by adjacent hotels. In any of the Strip Hotels just getting from your room to the lobby is usually a long, long walk. Cab lines can be long. For convenience sake, you might want to choose your hotel based on a show you’re going to see or a group of restaurants you plan to eat at. If you’re planning on a foodie trip then staying at Wynn/Encore or Venetain/Palazzo which are adjacent properties and have roughloy 50 top restaurants between the four properties, including four Michelin Star rated restaurants. Venetian/Palazzo Each have a mall which is also interconnected. Mandalay Bay has a smallish mall Mandalay Place which connects to Luxor. Chrystals at CityCenter very high-end shops. If you have to ask, you can’t afford it! Bellagio and Wynn don’t have separate shopping malls, but both have walkways loaded with high-end stores such as Brioni. Fremont Street is located in the downtown area of Las Vegas, about three miles from the The Strip. Fremont Street offers some of the best gambling conditions in Las Vegas combined with lower table minimums than available on the Strip. Popular Off-Strip properties include: The Palms; The Hard Rock; Rio; Orleans and Gold Coast. These properties are located near the Strip. Properties further away on Boulder Highway include Sams town and Arizona Charlie’s. Off-Strip properties tend to be popular with locals, and like Fremont Street casinos tend to offer lower table minimums and generally better odds. The Strip is roughly four miles long and can be divided into quasi neighborhoods, so why not pick a Hotel in your preferred neighborhood. North Strip Wynn/Encore anchor the area with Venetian/Palazzo adding to this high rent neghborhood. Far North Strip includes Circus Circus; Riviera; Slots of Fun low rent and run down and getting sparse with Sahara closing. The Stratosphere is even further North, but not many still consider that the Strip. South of Venetian is the Strips own Fremont Street Experience with Casino Royale; O’Shea’s Harrahs; Imperial Palace and Flamingo providing Strip customers a close facsimile of a Fremont Street casino experience with low table minimums and a sort of run down party atmosphere. CityCenter claims for itself its own neighborhood, complete with lots of expensive artwork on public display. I have an affiliate relationship with the following Las Vegas Hotels, if you book a room through the following links I get a small, very small commission, that is greatly appreciated. VegasMavens.com has been notified by Alltop.com that it will be included in the Las Vegas, NV page of Alltop. Alltop is a curated aggregator of the best websites and blogs on the Internet. The video on the about page of Alltop gives a nice introduction to the service, which by the way is free. Guy Kawasaki is one of the founders of Alltop. Guy is longtime member of the Silicon Valley Tech community, dating back to his days at Apple where he was a product evangelist for the original Macintosh.